The Washington Adult Congenital Heart Program (WACH), part of Children’s National, earns accreditation from the Adult Congenital Heart Association for providing high-level, integrated care to patients with congenital heart disease. Anitha John, M.D., Ph.D., a congenital heart disease (CHD) specialist and the director of the Washington Adult Congenital Heart Program (WACH) at Children’s National Health System, is a master of creating and leading multidisciplinary teams and networks to drive innovative standards to accelerate personalized treatment for adults born with heart conditions. The Adult Congenital Heart Association (ACHA), a national organization dedicated to advancing adult congenital heart disease (ACHD) care, announces WACH as one of 19 medical centers in the country – and the first in the Mid-Atlantic region – to earn its accreditation, which signifies a center that provides high-level, comprehensive care. WACH receives this accreditation by meeting ACHA’s criteria, which includes medical services and personnel requirements, and going through a rigorous accreditation process, both of which were developed over a number of years through a collaboration with doctors, physician assistants, nurse practitioners, nurses and ACHD patients. There are 1.4 million adults in the U.S. living with one of many different types of congenital heart defects, ranging among simple, moderate and complex. A study published in Circulation examined mortality rates among 70,000 patients living with CHD over a 15-year period, from 1990 to 2005, and saw mortality rates fall with referrals to specialized ACHD care centers. Dr. John has a unique background to elevate standards of ACHD care, while creating tailored prescriptions. She is one of a handful of physicians with subspecialty training in ACHD, which she completed at the Mayo Clinic. Her formal training in internal medicine and general pediatrics, completed at Brown University, fits well with the subspecialty training she received as a pediatric cardiology fellow at Children’s Hospital of Philadelphia. Her research now focuses on clinical outcomes in congenital cardiology and advancing multicenter research efforts in adult congenital cardiology. From March 2016 to 2018, Dr. John led the Alliance for Adult Research in Congenital Cardiology, the major multicenter research group in the U.S. focused on ACHD research. She’s also working with experts and patient advocates to guide efforts to set up a future ACHD patient registry, which will continue to guide research efforts and educate providers about ACHD care. To help facilitate collaboration, Dr. John guides quarterly meetings of the Mid-Atlantic ACHD regional group. Established in 2011 through Children’s National, the group has expanded to include ACHD providers from over 18 programs/practices from across the East Coast. This group provides a forum for patient case discussion and programmatic support. More importantly, the professional collaboration has served to not only improve patient care but also provides support to providers as they continue to care for a growing population of patients. This type of collaboration fosters mutual understanding and sets the stage for a relaxed but collegial environment where questions flow and learning occurs. To further facilitate education, she created an inaugural patient day at the 7th Annual Adult Congenital Heart Disease in the 21st Century conference this past year, allowing patients to have their own educational summit – while opening the opportunity to providers to stay an extra day to learn about patient-centered care. The conference relies heavily on the participation of the Mid-Atlantic ACHD regional group of providers. 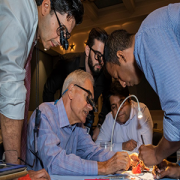 Patients learned as much about 3D heart models, pacemakers and noninvasive surgical techniques as they did about personalized approaches to lifestyle care, from practicing mindfulness to hearing about communication strategies to use with their medical teams and families. A variety of experts, from cardiac surgeons to clinical social workers, led the panels and breakout sessions. “We’re empowering patients to become an active participant and an engaged member of their medical care team,” adds Dr. John. ACHA supports WACH’s efforts and spoke at the conference, complementing its mission to serve and support the more than one million adults with CHD, their families and the medical community. The WACH team includes not only Dr. John, but ACHD cardiologists Seiji Ito, M.D., and Tacy Downing, M.D. 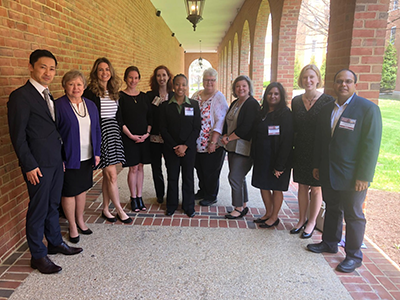 ; Pranava Sinha, M.D., surgical director; Rachel Steury, R.N.P., advanced practitioner; Nancy Klein, R.N., clinical coordinator; Emily Stein, M.S.W., social worker; Whitney Osborne, M.P.H., clinical research coordinator, and Ruth Phillippi, M.S., program coordinator. 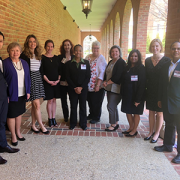 The team works together seamlessly to fulfill the program mission of achieving clinical excellence, promoting research and providing education in the care of adults of with CHD. For more information about WACH or to take advantage of resources for ACHD providers, please contact 202-821-6289 or visit www.ChildrensNational.org/WACH.